Posted in Art/Craft and tagged hack, remote at 9:39 am on October 9, 2018 by Chompsky. I used to have a phillips remote that had a flap on it to cover the “advanced features” it was actually a great idea. 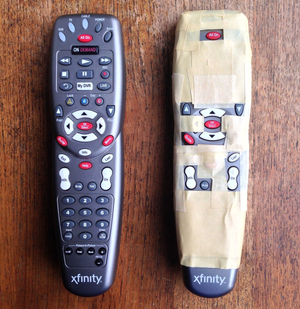 Remotes are horrible. I remember my parents-in-law having one which had a slide out section for the extra buttons. I locked the slide out bit with some tape, and everyone was happy. Nah. Learn to use everything I say! Press all of the right buttons…….even the obscure ones. Life motto. My mates dad used a long length of dowling rod set along top of settee, as he refused to throw out his push button tv unless it was actually broken. It did require a great aim to press the right buttons so the glasses had to be adorned first. And yet he was a millionaire.